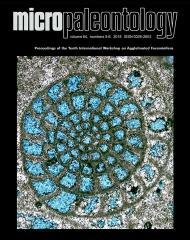 ABSTRACT: Benthic foraminiferal assemblages, used widely as paleoenvironmental indicators, can potentially provide numerical estimates of relative water depth. The quality of this bathymetric proxy was tested here directly using onshore-offshore transects across two present-day marine basins: (1) Saros Bay (northern Aegean Sea), with sampling sites ranging from 15 to 500 m water depth; and (2) Marmara Sea (between Black Sea and Aegean Sea), with sampling sites ranging from 15 to 350 m water depth. For both marine basins, multivariate ordinations of calcareous and agglutinated foraminifera demonstrated that samples varied predictably in faunal composition along regional depth gradients. The multivariate ordination scores and water depthwere highly and positively correlated in all cases: r2 = 0.74 (Saros Bay, agglutinated foraminifera), r2 = 0.67 (Saros Bay, calcareous foraminifera), r2 = 0.68 (Marmara Sea, agglutinated foraminifera), and r2 = 0.96 (Marmara Sea, calcareous foraminifera). Comparably robust relationships between ordination scores and water depth were observed when data were pooled across basins and/or foraminiferal type. These results suggest that both agglutinated and calcareous benthic foraminifera provide robust quantitative proxies of water depth. Multivariate ordinations based on agglutinated foraminiferamay potentially yield numerical estimates of water depth in the geological record and provide a quantitative environmental framework for paleontological and stratigraphic interpretations.